AWS::CloudFormation::Interface is a metadata key that defines how parameters are grouped and sorted in the AWS CloudFormation console. When you create or update stacks in the console, the console lists input parameters in alphabetical order by their logical IDs. By using this key, you can define your own parameter grouping and ordering so that users can efficiently specify parameter values. For example, you could group all EC2-related parameters in one group and all VPC-related parameters in another group. In addition to grouping and ordering parameters, you can define labels for parameters. A label is a friendly name or description that the console displays instead of a parameter's logical ID. Labels are useful for helping users understand the values to specify for each parameter. For example, you could label a KeyPair parameter Select an EC2 key pair. Only the AWS CloudFormation console uses the AWS::CloudFormation::Interface metadata key. AWS CloudFormation CLI and API calls do not use this key. A list of parameter group types, where you specify group names, the parameters in each group, and the order in which the parameters are shown. A mapping of parameters and their friendly names that the AWS CloudFormation console shows when a stack is created or updated. The following example defines two parameter groups: Network Configuration and Amazon EC2 Configuration. The Network Configuration group includes the VPCID, SubnetId, and SecurityGroupID parameters, which are defined in the Parameters section of the template (not shown). The order in which the console shows these parameters is defined by the order in which the parameters are listed, starting with the VPCID parameter. 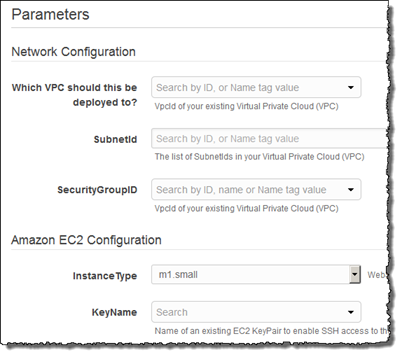 The example similarly groups and orders the Amazon EC2 Configuration parameters. The example also defines a label for the VPCID parameter. The console will show Which VPC should this be deployed to? instead of the parameter's logical ID (VPCID). default: "Which VPC should this be deployed to?"